Buy Walking Boots, Outdoor Clothing & Lake District Maps and Guides. Welcome to the Lake District Website. The Lake District is one of the nicest National Parks in England. It has some of the best mountain scenery, and as the name suggests, contains a plethora of lakes of various sizes within its boundaries. In July 2017, the outstanding natural beauty of the Lake District was acknowledged internationally by UNESCO, who awarded the Lake District National Park world heritage status. 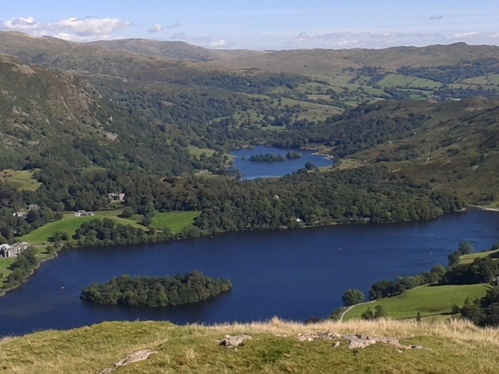 Rydal Water and Grasmere in the Lake District, an area that has close associations with the Lakeland poet, William Wordworth. The natural beauty of the Lake District inpired his work, along with many other poets and artists over the ages. This inspiration was a key factor in the Lake District National Park being awared UNESCO World Heritage Status in July 2017. This site is for people wanting to explore the Lake District and get to know the area's Fells, Lakes, Valleys and Villages. There are 3D maps, walking routes, virtual tours, place descriptions and photographs. You can also plan your visit to the Lake District by finding Hotel Accommodation and researching the areas where they are located. I want to help you really enjoy this fantastic area, whether you are a fell walker, general visitor, or just want to explore the Lake District at home from your PC. I have set up the site so you can explore the Lake District by its Fells, Lakes, Valleys and Villages. Each has its own home page with more information and menus to help you navigate. There is also a home page for the many Lake District Maps on this site, each one with its own individual theme or area. There is, for example, a general overview Lake District Map that's well worth checking out (it uses the Google Earth Plugin). If you are planning a trip to the Lake District sometime in the future, you might want to take a look at my Lake District Online Walking Shop. Choose from a selection of outdoor products, including Lake District maps and guides, walking boots, rucksacks, and camping gear etc, all at cheaper internet prices. Once you have filled your shopping cart, just click the link which will take you to Amazon.co.uk, with whom I am affiliated. They will then fulfil your order. Visit the Lake District Online Walking Shop. 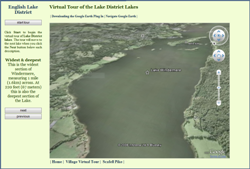 This site uses the Google Earth Plugin on many pages to help bring the Lake District to life. This innovative software presents us with a fresh way of viewing the Lake District from a range of new perspectives. You can view 3d images of the mountains and valleys, and take guided tours around the villages and lakes. You are also free to visually navigate the Lake District Maps going wherever you choose. I have found this a great way explore Lakeland in intricate detail. The Goggle Earth Plugin is free software that can be downloaded in a couple of minutes from this site. This site also uses the Google Earth plugin to overlay walking routes in addition to providing descriptions about mountain features on many of the Lake District Fells. If this is of interest to you, I recommend you take a look at the pages on Scafell Pike, Helvellyn, or the Langdale Pikes. You can also see a full list on the Lakeland Fells home page. 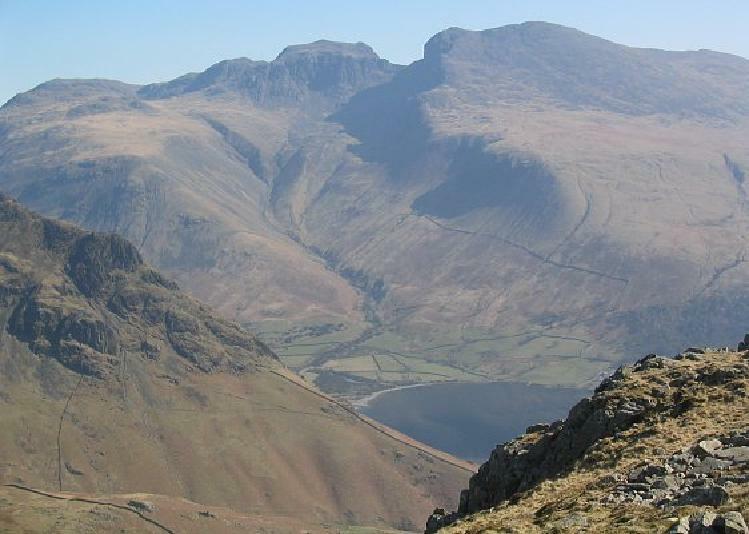 If you are planning a walk on Scafell Pike please check out the Lake District website's weather page. I hope this site brings you as much pleasure and interest in the Lake District as it has done for me. Screen shot of Helvellyn 3D map and Virtual Tour. 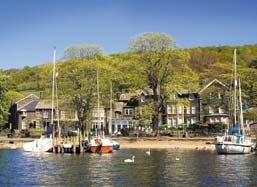 Screen shot of the English Lake District Virtual Tour of Lakes. 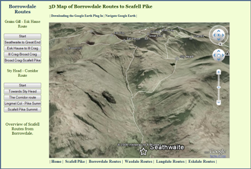 Screen shot of Borrowdale to Scafell Pike 3d route map. If you are thinking of taking a break in the Lake District, you can now use this site to find and book Lake District hotel accommodation. There are links which take you to information about hotels in the areas that you have been reading about. Once you find a hotel that is of interest, just click the button to go to the relevant page of an external travel website, to check prices, availability, and to book a room online.